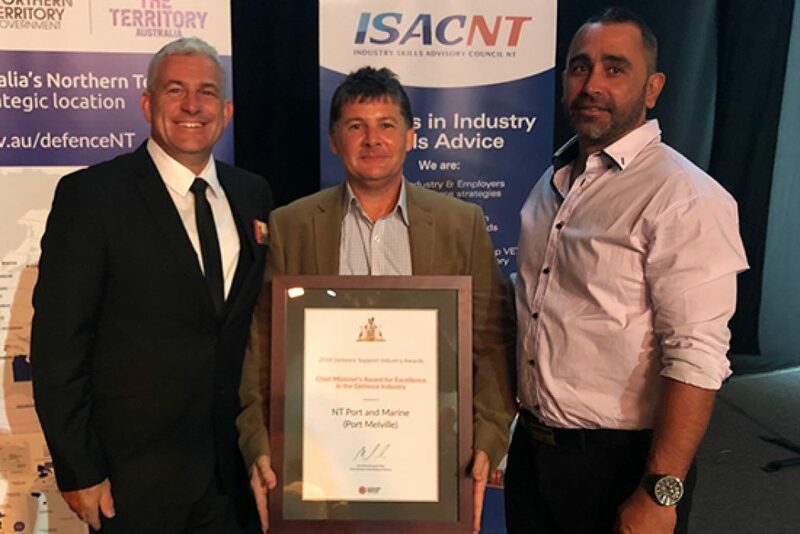 AusGroup’s port and fuel supply business, NT Port and Marine has been honoured with the Chief Minister’s Award for Excellence in the Defence Industry at the 2018 Defence Support Industry Awards. Presented at the gala dinner on 10 October, the award was received by Executive General Manager Nathan Pike at the Darwin Convention Centre and was a huge achievement for business. Following the full commissioning of our fuel systems in March this year, it was a proud moment for everyone involved to have the first vessel bunkered at Port Melville be a Royal Australian Navy Patrol boat. As a member of the Defence Reserve Support Employer Program, we are committed to respond and support the Australian Defence Force whenever called upon and in whatever capacity we can. From the outset, our goal was to build and operate Australia’s northern most port, that would service and support the Australian Defence Forces, provide a service centre for oil & gas exploration and operations in our northern waters and become a logistics hub for the shipping, fishing and Melville Tiwi Islands forestry industries. In achieving this, we are able to make significant contributions to the continuing economic development of the Tiwi Islands, providing training and employment opportunities for the Tiwi People. Over 80% of our team live locally and 30% are indigenous Territorians. Through a great relationship with the Tiwi Island Training and Education Board, we are building programs and pathways to increase that number as we continue to grow. We look forward to continuing to support our clients in the Defence, oil & gas, shipping and forestry industries and the local Tiwi community.